I’m participating in the fourth annual Knitting and Crochet Blog Week, hosted by Eskimimi of Eskimimimakes blog. Day 1: The first blog topic of the week is The House Cup, a la Harry Potter. The task: choose a “house” from the list provided and blog about the way in which that house represents your crafting outlook/style. It didn’t take me long to pick my house. Monkey all the way. I love a challenging project. I get antsy if I don’t have at something on my needles that is teaching me something new. It was the combined influence of Ravelry and my Mother’s gentle urging that convinced me to poke my nose outside by comfort zone. Mom helped me choose my first lace pattern. It was a simple Jared Flood autumn leaf pattern, but to me it was a taste of the exotic. And exotic started to be a craving. Less than two years later, I’m knitting complicated Romi Hill lace patterns and I’m as happy as can be. I finished Fiori Di Sole one week ago. Just one week. 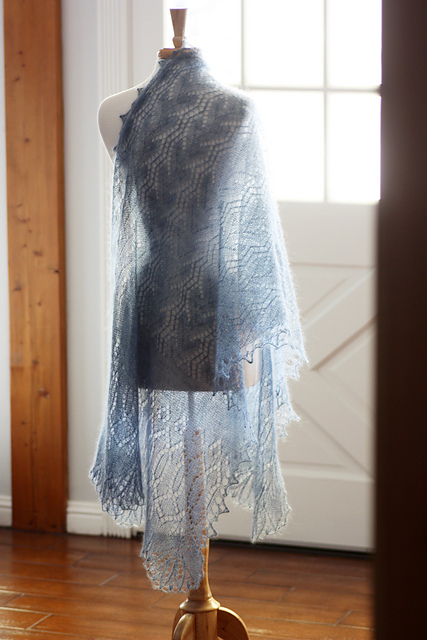 The shawl had barely left my needles when my fingers began to itch for a new challenge. 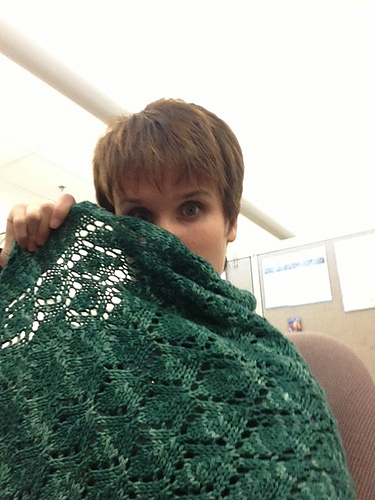 24 hours later, I had cast on another Romi Hill lace shawl. Finished just in time for my wedding. Next up. I’m a glutton for punishment. Heavenly, by Romi Hill, as seen on Ravelry. It’s a sickness, it must be. An addiction. To the adventure, to the thrill. One thing I love about this whole things is that I can pick my own patterns and challenge myself as much or as little as I want and there’s no one to judge me. In what other part of my life do the results of my efforts truly matter to no one but me? And how many of those are as fulfilling as knitting? I can’t think of any. I feel my family are the ‘victims’ when it comes to my knitting sometimes, then I remember I’m giving them handknitted piles of love and they better be grateful for it! You are definitely a monkey! I am in awe of those shawls. I hear ya. I remember my first dishcloth. Full of holes, it was. Thankfully Grandpa didn’t mind. My first hats on DPNs were full of ladders. But they still keep your head warm. Wow, those are some wonderfully extravagant pieces, gorgeous! I look forward to visiting more this week. I am in the bee house – does that make me a rival LOL?? Wow, your shawls are absolutely stunning! I liked thinking about my knitting style – I think I’m a bee! Your shawls are beautiful. Knitting lace is addictive. So many beautiful styles and patterns. Lovely knitting. I would like the opportunity to make more complicated things, but with two children around I would spend more time ripping back than knitting so I am contenting myself with things that at least have a chance at being finished. for now! Love what you say about hatting everyone around ! Your shawls are amazing ! Maybe I should get out of my comfort zone sometimes… once I’m done with the dozen projects I have going on.. I have a few Anne Hanson patterns in my favorites. Thanks for the reminder. I should definitely look for a pattern of hers next time I crave lace. hello fellow monkey! glad Mum gave you a gentle nudge in the ‘lace’ direction they are truly beautiful. I love those shawls. The satisfaction you must feel when completing them must be immense. I like the bit where you say you can choose which project. Very sensible, obvious but not always realised! I know what you mean about it being an addiction! But it’s a good one, definitely. The shawls are beautiful, and I’m always glad to find another “Monkey”! Me too. There are a lot more monkeys out there than I anticipated. Early polling seemed to indicate that most people identified as bees. I guess the Bees are just quicker than the rest of us!